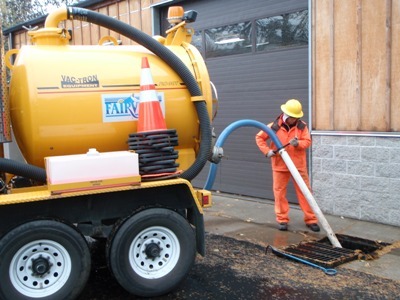 City of Fairview Public Works personnel operate and maintain the City's stormwater system. Maintenance practices which remove excessive sediment, trash and debris can help prevent flooding and increase stormwater treatment,thereby enhancing stormwater and stream quality. The City's stormwater system provides conveyance of surface water runoff for flood control and water quality protection and enhancement. The City's stormwater management facilities consist of a series of collection and conveyance systems, detention systems, and treatment facilities. Treatment facilities are typically a combination of landscape and structural components that slow, filter, detain, and/or infiltrate stormwater runoff after a rainfall event. Proper and regular maintenance of the stormwater system, including components such as pipes, inlets and manholes maintains the system as designed thereby limiting localized flooding. Regular inspection and cleaning of specialized stormwater quality facilities such as detention ponds and grassy swales is also critical. Without proper maintenance stormwater flows may bypass these facilities without any treatment. Public Works personnel perform stormwater system maintenance activities that integrate water-quality friendly practices.